Cave Story is a wonderful indie game that released in 2004 on PC. That version was and still is free, so how does one explain recreating the graphics of the game into polygon form and charging $40 for the new creation, Cave Story 3D? Let's see if we can't find out with this Better Late Than Never review. Should You Cave In and Buy This Game? Released a decade ago on PC, Cave Story is a game that many indie developers owe a lot to. Its developer showed that with enough skill and drive anyone can create a deep, compelling, worthwhile game. Six years later in 2010, Cave Story was ported to both Nintendo's current platforms in digital form on WiiWare and DSiWare. While the original PC release was freeware, these ported version held a double digit price tag. A year later and the first retail release of Cave Story ended up on the Nintendo 3DS. 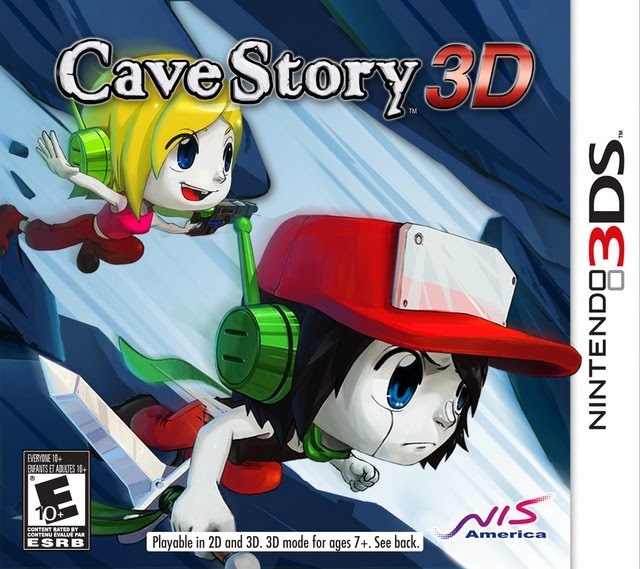 This version, Cave Story 3D, is the one we're focusing on today, a game that at launch carried a $40 price tag. With multiple cheaper alternatives for those with a hankering for Cave Story, is this 3DS remake worth it? 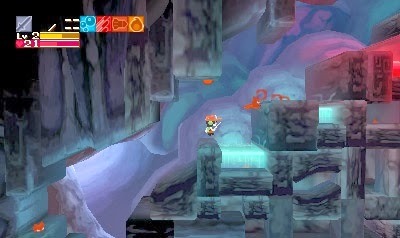 The story in Cave Story 3D revolves around an amnesiac who awakens inside of a cavernous complex. Wandering through this cave, the main character eventually meets up with rabbit-like residents who claim that a sinister man simply known as the Doctor is plotting to coerce the cave's residents into serving as his army to take over the world. While the tale certainly has a wide variety of somewhat intriguing characters, I found myself not becoming attached to any of them. I quickly forgot their names, which meant that if another character told me that an item I needed was held by *insert name here*, I'd either have to aimlessly wander around the game's world or consult a guide (an absolute last resort, mind you) to find them. One big issue I have with how many events in Cave Story 3D progress is that are an abundant number of tedious fetch quests. It seems in each new area of the cave you enter, there is an incessant amount of backtracking just to fetch this, find that, bring this back to that character, etc. It just seems like unnecessary padding, and quite frankly, it's just not that much fun. Now, while that may seem like a sour way to introduce my thoughts about Cave Story 3D, there's a lot to love about the game. Let's start with how the game plays. Cave Story was based of the creator's love of franchises like Metroid, and Cave Story is loosely modeled on that Nintendo classic's structure. While you don't gain as many new abilities to access new areas, various transporters open the way to totally different sections of the game as the story progresses. 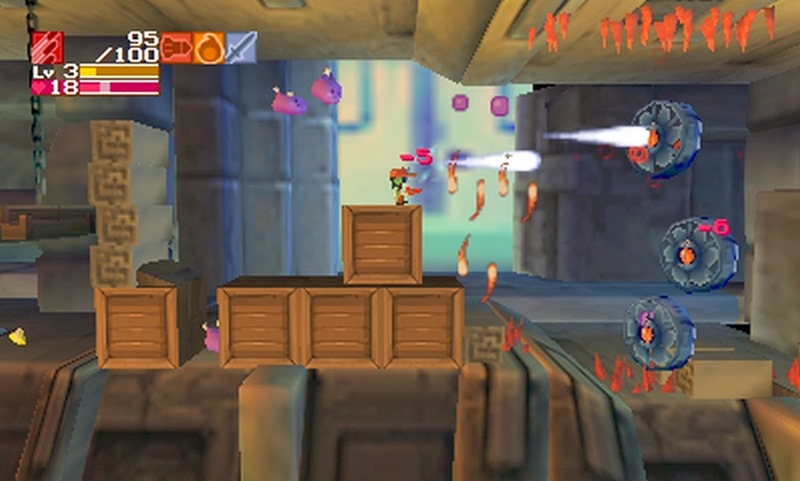 Following the Metroid structure, there are multiple hidden heart containers that bestow increased health to our hero (he can now reach 100 health as his max), as well as plenty of boss battles that can pop up when you least expect them, usually foreshadowed by a save point in the room before it. These break up the exploration of Cave Story 3D rather well. 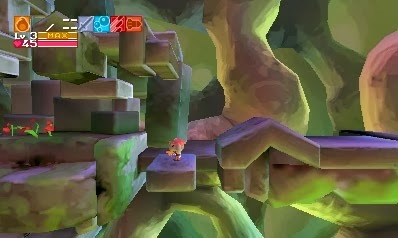 Cave Story 3D's unnamed protagonist will have to deal with plenty of challenges, both platforming and combat-related. For combat, he comes across new weapons, such as a machine gun, missiles, a blaster that sprays out bubbles, a flamethrower, among others. Defeating enemies with these weapons results in them dropping health, missile ammo, or yellow triangular shapes. These yellow triangles allow your currently equipped weapon to gain experience. Gain enough experience with a weapon and it levels up, giving it greater firepower and capabilities. As easy as it is to level up a given weapon to its maximum, it's also just as easy to lose a level, performed by taking enough damage by either enemies or cave hazards. Depending on whether or not you satisfy certain conditions within Cave Story 3D (some more obvious than others), you will either get a normal ending after facing off against the supposed last boss, or the special ending, which has you entering a super secret level that is full of deathtraps and other obstacles. It is without a doubt the hardest challenge that Cave Story 3D will throw at you, but the satisfaction of completing it is quite high. Cave Story veterans and longtime fans know that the original freeware version paid homage to classic games with its graphical style. Cave Story 3D offers an entirely updated look, full of polygons, more interesting backgrounds, and a highly detailed world. It doesn't just linger on the plane our hero runs, jumps, and shoots on. No, it permeates into the background and foreground, creating a substantially more immersive world than its predecessors. Of course, there are some drawbacks to the new 3D graphics. For one, being in a cave and all, one would expect it to be dark. Well, in this 3DS remake, it is certainly dark in many areas, perhaps too dark, as the color palette of Cave Story 3D is less than bright and cheery. This makes knowing where you can and can't jump a little difficult in some places. However, the lower screen map does alleviate some of this trouble. Also updated in this version of Cave Story is the music. The updated themes sound great, but to those who have known the 8-bit sounds of past Cave Story iterations might find it hard to get accustomed to, and there is no way to play the game with the classic soundtrack. Cave Story 3D is a game that when it launched, it cost $40. The asking price now is higher, even for copies that aren't even new. This makes recommending Cave Story 3D a tough proposition, especially since now there's a downloadable version with the classic sprites, visuals, and music available on the Nintendo 3DS eShop. If you must have a physical copy of Cave Story, then you probably already have this title in your collection from when it released. If not and you deem the minor additions of content and all-new polygonal graphical style to be worth the cost, then prepare to pay a fine penny for this game. I don't think it's worth it, but then I've never been one to cave in on costly purchases. Level design has always been a feature of games that we've marveled at. There's a big difference between a level that is frustrating due to challenge and a level that is frustrating due to design. Now, we aren't going to pretend that we are masters of creating excellent levels. No, we're very much not. However, we believe we've had enough experience playing games that we can weed out the good levels from those that are bad. This series of articles talks about the latter, where we focus on those levels that either poorly designed, frustrating for all of the wrong reasons, or just boring in general. (We have a series of articles dedicated to great levels anyway.) After we've exhausted our picks for this third edition of Bad Levels in Gaming History, help us come up with some more levels for future installments and your reasoning as to why your chosen levels are so bad. Miss out on Volume One and Volume Two? Click those links, then! ...Oh, yes he is! Poochy Ain't Stupid is the unlockable level found in the first world of the SNES classic Super Mario World 2: Yoshi's Island. It is unlocked by scoring a perfect 100 points on each of world one's eight levels. If one were to unlock this level without venturing into the next world, then Poochy Ain't Stupid would be the player's first encounter with the adorable-looking dog. It's also important to note that these extra unlockable levels do not contain any mid-stage checkpoints, so if you perish in the level, you must start over from the very beginning. 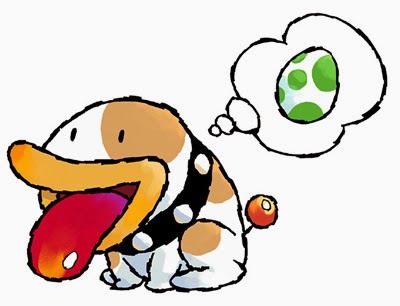 Poochy Ain't Stupid is a thorn in many players' sides, and that can really be said about any of Yoshi's Island's six extra stages. However, what makes Poochy Ain't Stupid so unbelievably frustrating is actually a combination of things. First, the level is almost totally auto-scrolling, a game convention that doesn't make any sense but is usually used to present a fun challenge. 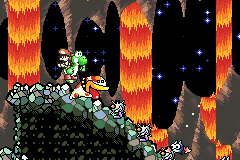 The second part of Poochy Ain't Stupid that makes for frustration is that dying is quite easy, what with all of the one-hit kill lava inside the cave. You're really at the mercy of the titular level character Poochy. Looking at his cute but not very bright mug certainly doesn't help things. 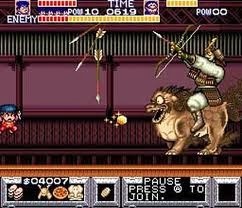 In the level you must ride on the back of the pooch for the majority of the level. When you are on top of Poochy, which way Yoshi is looking is the way that Poochy will move. Simply completing the level is an already arduous task, but combine that with the 100% completion goal (having 30 stars, collecting all 20 red coins, and nabbing all five flowers) and you have a really tough, really aggravating challenge. We do love how the level is much different than others in the game, and that its premise is very clever. However, it's not really the execution of it more so having to deal with the ever-hyper Poochy's movement eccentricities, but the forced auto-scrolling and erratic behavior of Poochy make this level quite despised. Like a fair share of levels in Super Monkey Ball 2, although the game is still very much recommended and enjoyable, Pistons is one that is a crap shoot. The level features a ramp that leads to a hexagonal platform made up of multiple thin paths that intersect one another. Of course, that isn't the entire level. 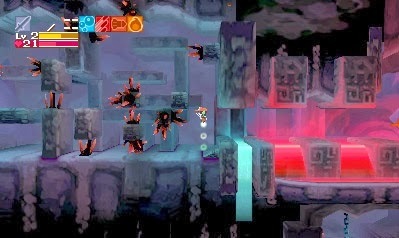 As the title of the level suggests, in the triangle-shaped holes that surround the paths a series of same-shaped pistons shoot upward. They quickly rise upward in a methodical pattern, one row after the other. The crap shoot comment here comes from the fact that unless you are incredibly quick and precise with your movements, you will be launched up into the sky. Strategy is pretty much thrown out of the window, as t's more hoping that you somehow land near the goal to finish this masochistic level than precise planning. 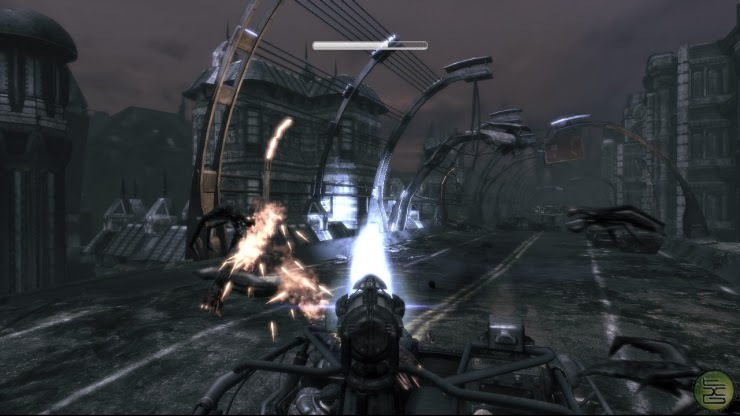 Many players gave up on trying to do Pistons "legit", instead parking themselves on a given piston, being shot into the air, and trying, however fruitlessly, to aim for an area nearby the goal. A popular criticism with Super Monkey Ball 2 is that a disturbing number of later levels require less finesse and more luck to overcome them. Pistons is just one example of such a level. Welcome to a poor level in an otherwise competent third-person shooter. Why, it's none other than Chapter Seven's Burnt Rubber from the original Gears of War. 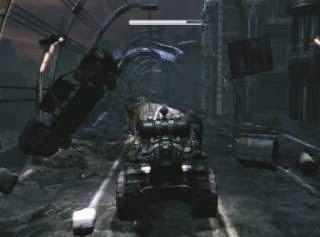 This level is all about driving a heavy junker vehicle through dilapidated city streets. This is all the while needing to shine the junker's UV turret on swiftly approaching Kryll, bat-like creatures that crave darkness and will mercilessly shred their prey alive. This wouldn't be so bad if you could drive and fire simultaneously. However, this is somehow impossible, even with having the rest of the Gears crew inside the junker with you. Perhaps they're too busy painting their nails... With warnings of Kryll coming from 6 o'clock, 12 o'clock, from the right, from the left, etc. This level is nothing but an inconvenience, a pain, and changing the game into something it shouldn't be, just to create some kind of unwanted variety. This is it. You've driven past the competition in every race so far. You've outperformed beyond anyone's wildest dreams. You've earned your victory lap countless times. Now, are you up for the final challenge? Well, get ready to be frustrated and disappointed. Why, it's Gran Turismo 4's final challenge, the Mercedes Showdown! While it might sound awesome taking control of the seemingly omnipotent Mercedes SLR Mac Laren, the actual vehicle has been fine-tuned to handle as well as butter on a sizzling pan. This level of artificial difficulty (a big reason why it's on this edition) is only made more irritating by the fact that you're racing against three lower end Mercedes vehicles. However, these cars have a three minute head start on your vexing-to-handle vehicle. Add in the fact that you're racing on a track whose real life version causes upwards of a dozen deaths per year, Germany's Nürburgring Nordschleife, and you have to wonder who the sadistic psychopath created this event was. Ah, the Flame Temple... 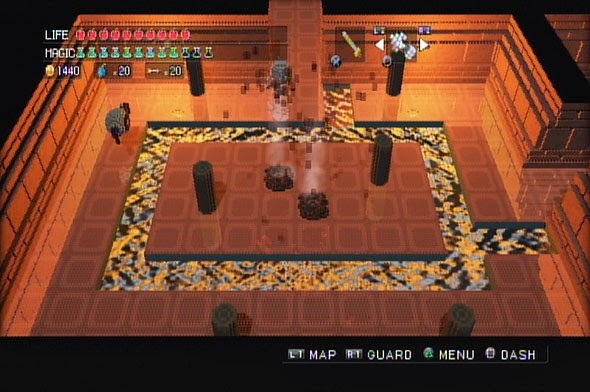 This dungeon from the excellent and old school Zelda-like PS3 game 3D Dot Game Heroes is a notorious one among fans of the title. It's not even just the dungeon itself that is difficult and irritating (and it very much is), but the labyrinth that precedes it, a very obnoxious cavern full of falling rocks, is essentially the harbinger of what lies ahead. The Flame Temple itself has a plethora of enemies that do a lot of hurt on heroes. There's the Gray Magi, a wizard that only one specific spell will defeat it, it can drain your magic quite quickly with one successful hit, and it vanishes across the room like it was on fire. How about the Dark Ropus, a spider that scurries speedily along the dungeon's floor. If it comes in contact with the player, it completely drains your magic and it leaves you will only a half of a point of health. Let's not forget about the Darknut-inspired Knight, which can only be attacked from behind, has a fair amount of health, and is pretty strong to boot. 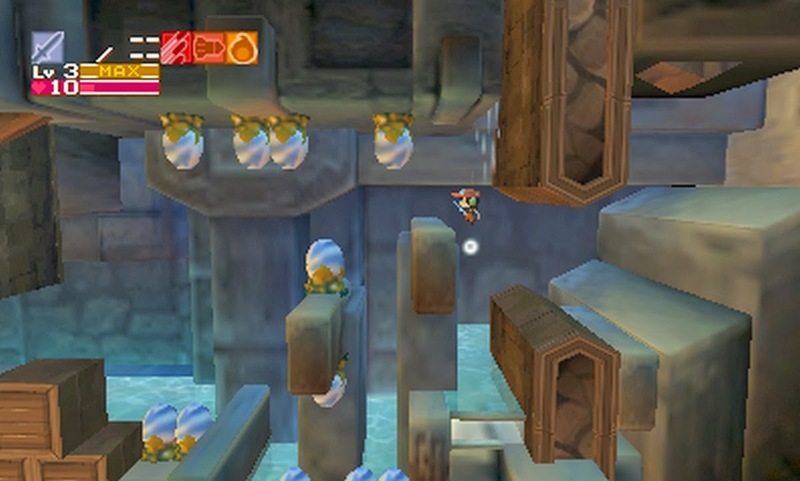 But all of that doesn't make for a bad level; it just makes for a really challenging one. No, what makes 3D Dot Game Heroes' Flame Temple a bad level is its premise, which has the player needing to press certain switches to advance through the dungeon. 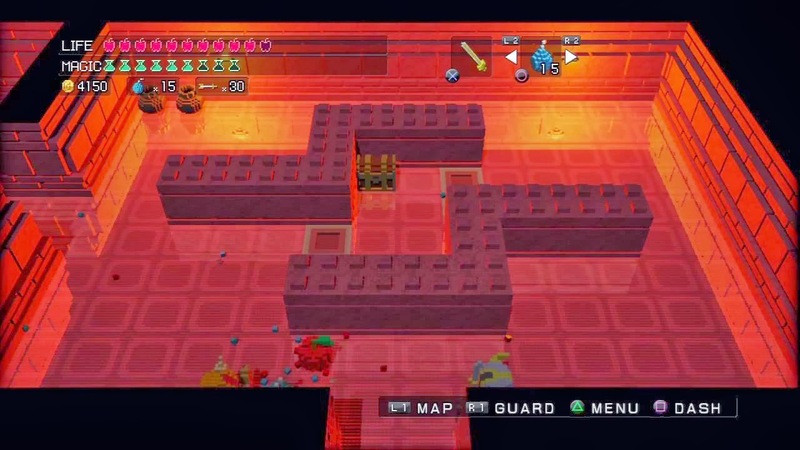 However, if you were to save, quit, and then later reload the game, the switches will revert back to the way they were upon entering the temple, essentially removing all of your progress. Oh, but that's not the kicker. The kicker is that upon dying, which will occur as many times as there are months in a year, maybe more so, the switches will do the same thing. Have fun retrying this temple over and over again, and your prize for reaching the dungeon's furthermost room is a seriously difficult boss. There's old school difficult, and then there's the more ridiculous "Nintendo hard" difficult. This is the latter, and it's not that much fun. We're still reeling from Valentine's Day, but we do have a new installment of SuperPhillip Central's Favorite VGMs to share with our readers. We've tried to create a collection of the best video game music ever released, and our list has been made up by hundreds of series and games for consoles and handhelds new and old. We add five more VGM volumes to our list with such themes from such games as Final Fantasy Tactics, Final Fantasy IX, and Sonic Unleashed. This is from one of Phil's favorite soundtracks. 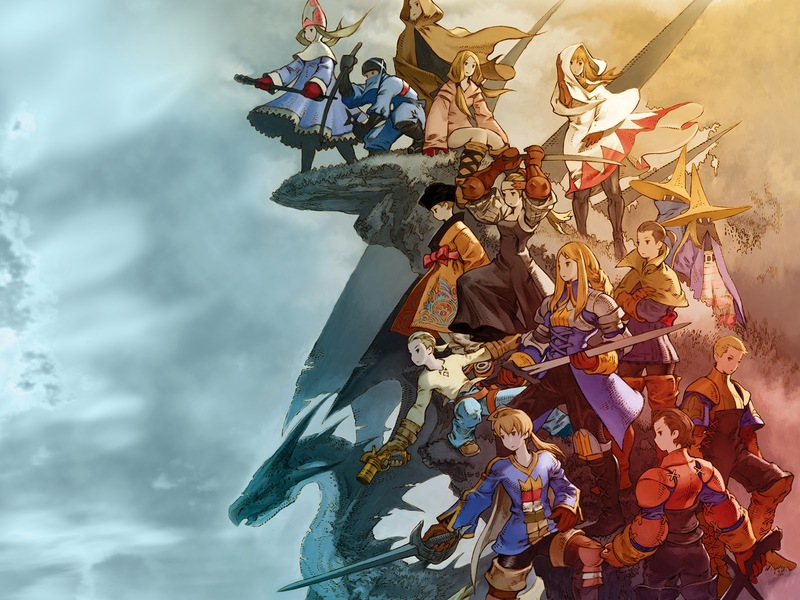 Final Fantasy Tactics is a musical tour de force to him, that he considers composer Hitoshi Sakimoto's best work. Of course, Masaharu Iwata is credited as co-composer on the soundtrack, so it's not as if Sakimoto-san did all of the work. A Chapel is one of the themes heard in random encounters in Ivalice. The fun thing about Sonic the Hedgehog soundtracks is that they don't focus on just one or two musical genres. Sonic Unleashed's Empire City - Day is a funky little theme that makes great use of the harmonica. 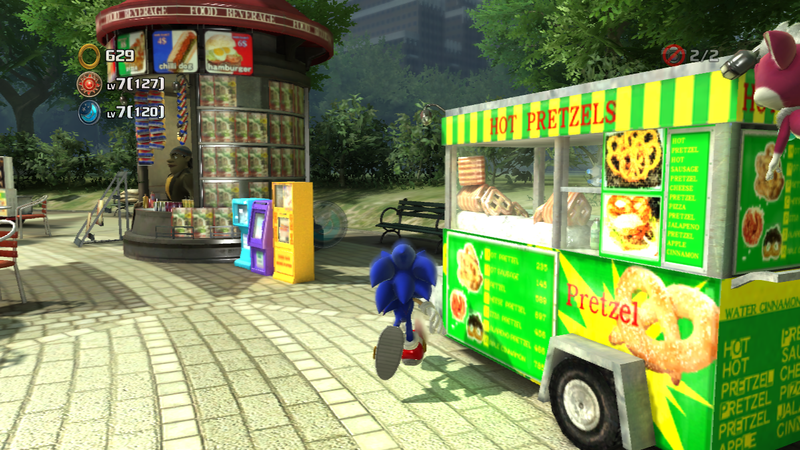 It's important to note that Empire City and its subsequent Sonic and Werehog levels only appeared in the HD versions of Sonic Unleashed. Hence, why the Wii and PlayStation 2 are not mentioned in this volume. We're going back to the 16-bit era with the Super Nintendo's The Legend of the Mystical Ninja, the first in the Ganbare Goemon series to reach the West. The game is a mishmash of RPG, adventure, and platforming elements to create a title that is a must for 16-bit fans. The oriental soundtrack is superb, too, with the game's Boss Battle theme being one of the best of the very capable bunch. Nobuo Uematsu is one of our favorite video game composers, offering some of the most memorable music in the medium by far. 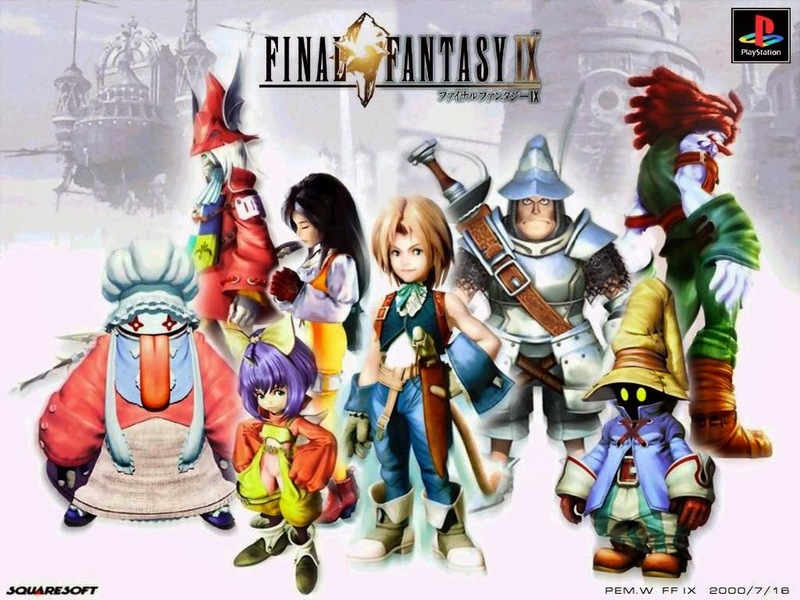 Feel My Blade, an early piece in Final Fantasy IX, is just another fantastic piece that is a part of Uematsu-san's impressive resume. It is a greatly paced theme that begins with a dramatic flair before leading into a fast-paced instrumental track. We aren't really interested in Japanese history, so the Dynasty Warriors series of games do little to excite us. However, playing a Dynasty Warriors game featuring an abundance of colossal mechanical suits of armor doing battle on land and in space does. It did so much that it made us seriously reconsider our relative indifference for the Dynasty Warriors series in general. 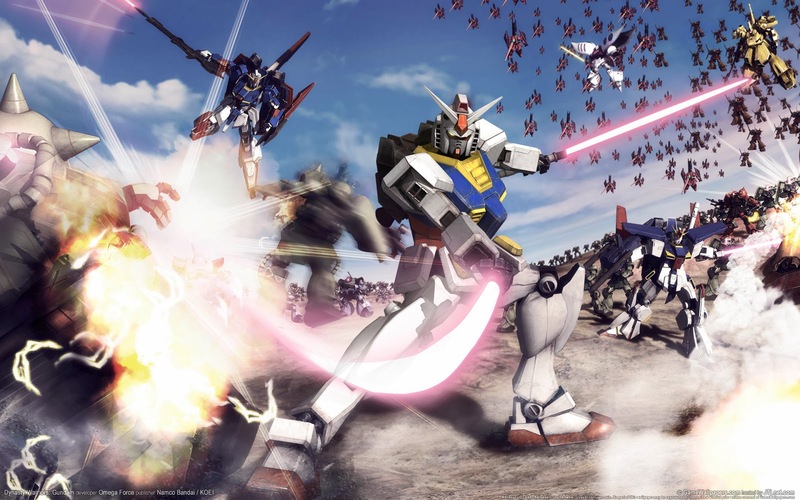 One part of Dynasty Warriors Gundam that shines the brightest is its music. It stands strong, even through repeated plays of the same themes, which one who plays the game will definitely hear repeatedly.